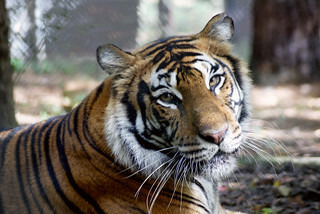 Life just got a little less painful for four residents at Carolina Tiger Rescue. A team from the Peter Emily International Veterinary Dental Foundation visited our sanctuary last weekend to perform life-enhancing dental procedures on Sebastian Lion and Saber, Shenandoah and Tio Tigers. 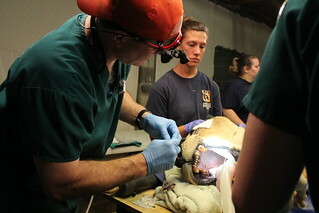 Doctors from the Peter Emily International Veterinary Dental Foundation work on root canals for Sebastian Lion. Saber and Shenandoah were bred out of profit; all four canines on both big cats were broken off, likely for entertainment purposes. Saber, our lone white tiger, was owned by a magician in Vegas when he was a cub. The two were probably a breeding pair at their former facility in Colorado, so we neutered Saber upon arrival. Sebastian and Tio had several fractured teeth. 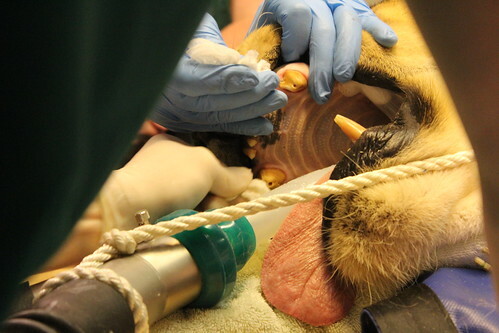 Our animal care team noticed the poor condition of Tio’s teeth during his intake exam upon his May rescue. 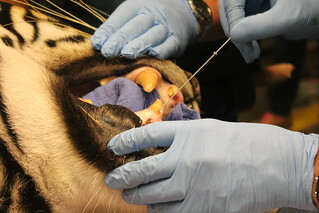 Keepers got a closer look at Sebastian’s teeth during a recent physical on the mellow lion. Both Carolina Tiger Rescue and PEIVDF prepared long and hard, working together to improve the lives of our captive wild cats. 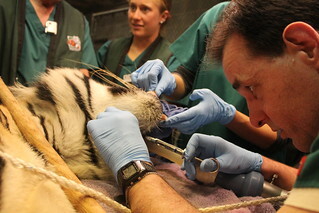 In a couple of weeks, the animals should be experiencing less pain. We’re so thankful for the work that PEIVDF does!